Moberg Pharma’s business model includes proprietary sales and marketing in North America and sales through distributors and partners globally. 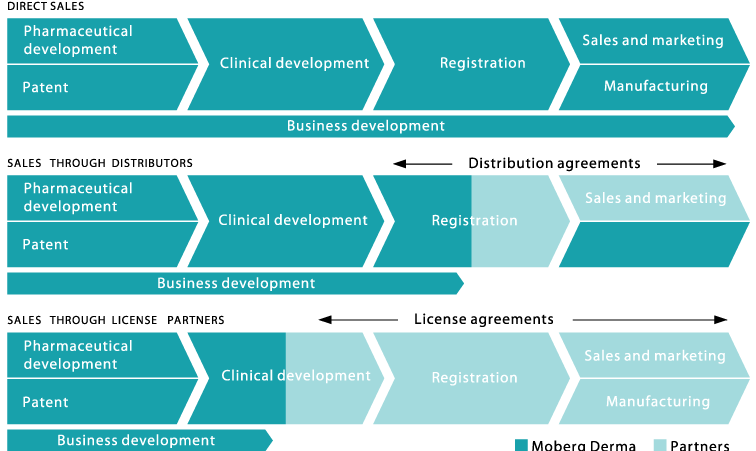 The company’s product development is based on innovative drug delivery and proven compounds, which reduces our time to market, development costs and risk compared with conventional drug development. We combine a business-minded approach with expertise in drug development and have a business and marketing team with solid experience of global product commercialization. We supplement our organization with external expertise and capacity, in areas including clinical development, production and commercialization.